The monthly progress meeting of Saudi Aramco Ex-Employees Association (SAEEA) was held on February 07, 2014. KAF highlighted activities took place during the month of January, 2014. Since it was the first meeting after SAEEA’s 9th reunion, KAF conveyed very positive and encourage able messages that he and other office bears received from all attendees. The monthly progress meeting was held at the residence of Mr. Ateeq R. Khan (ARK), who invited all office holders at his residence in order to discuss the requirements for registering SAEEA with the Government of Pakistan. GQK was requested to work closely with ARK and prepare the documents, needed for registration. KAF and other attendees reviewed the Annexure to Article-XII, Section 2 of SAEEA Bye Laws, prepared by GQK. Further review of the contents is required. IAK apprised the attendees that he managed to update SAEEA website concerning SAEEA 9th Reunion. MSH presented updated SAEEA account in the meeting. 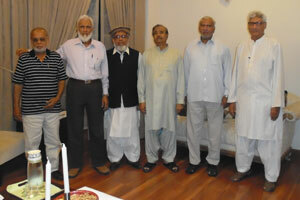 KAF prayed for all sick people, especially for Rafiq A. Burney who underwent a major heart surgery in USA.